Potatoes have a bad rep, but they are low in fat and full of fibre. 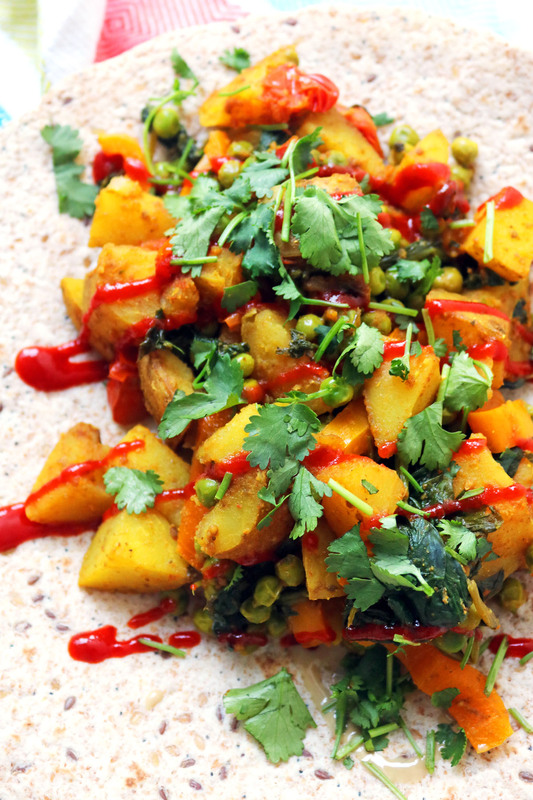 Spice them up in this fiery Bombay potato wrap. I’ve been working really hard recently on making sure I’m nourishing my body with a good variety of healthy foods. Eggs are a new favourite and my garden has been supplying us with plenty of leafy green veggies which has also been helping. But one vegetable I will admit I had overlooked is the humble potato. The high starch content means potatoes have got a bit of a bad reputation but I think its incredibly unfair. So many diets these days tell you to cut down on carbs, especially starchy carbs like potatoes but they really aren’t that bad. In fact, potatoes are more energy-packed than any other vegetable. They are also an excellent source of vitamin C and vitamin B6 (who knew!) They are a good source of potassium (more than a banana!) They are also fat, sodium and cholesterol free! Making Bombay potatoes isn’t quick – I will warn you now! The potatoes will take 20 minutes or so of cooking before they will have softened and become light and fluffy. Don’t worry, they are well worth the wait. Although they take a while to cook, we often add potatoes to curries and I’ve developed a few of my own Indian inspired potato recipes. This Bombay Potato Wrap is a real fusion. It’s not a million miles away from a dosa (a type of crepe which is often stuffed with veggies, including potatoes) and wrapped up. If you can get your hands on a couple of rotis then you will be making this recipe a little more authentic. But, the multi-seed wraps we used tasted great too. To garnish I’ve added a healthy handful of fresh coriander as well as a squirt of sriracha and a drizzle of tahini. They might not be the most obvious condiments to serve in an Indian inspired wrap but they are seriously tasty. Don’t have sriracha in the cupboard? Just add more chilli while you are cooking. Not a fan of tahini? Don’t worry, it’s optional! These Bombay Potato Wraps are fusion food at their best! Heat the oil in a large non-stick frying pan over a medium heat, then add the onion and fry for a few minutes until they have begun to soften. Add the potato to the pan and fry for 5 minutes until the edges of the potato have begun to soften. Add the minced garlic and ginger and stir for a minute or two, followed by the spices. Once the potatoes have been coated well in the spices, add the pepper and cook for another 5 minutes or until they have begun to soften. Next, add the tomatoes and a cup of water. Cook until the tomatoes have begun to break down and coat the potatoes. Stir in the peas and spinach cook until both of the green vegetables and the potatoes are ready. Serve in warm wraps with a drizzle of tahini, squirt of sriracha and a handful of chopped coriander. 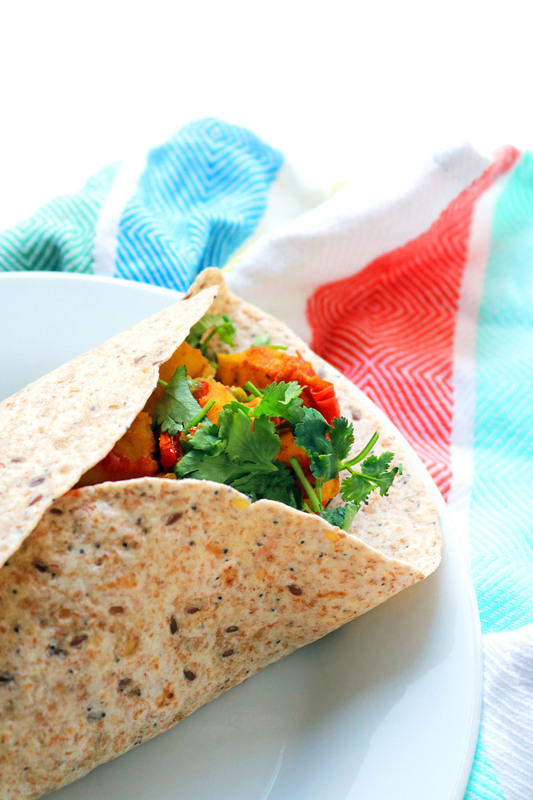 Oh my goodness Emma, this Bombay Potato Wrap looks simply heavenly! My family would all love this as with a veggie and spice lovers amongst us there’s something for everyone here! Carbs on carbs for the win!!! This looks absolutely delicious and I love all of those spices. I am a big fan of wraps and I’ve tried and made all sorts, but I am loving the look of this. Just gorgeous! Sharing it now! Thanks Jac, really appreciate it!